You know I'm all about green building, water conservation, recycling, etc., and if you know "the three R's," you know that reducing and reusing are just as important as recycling. 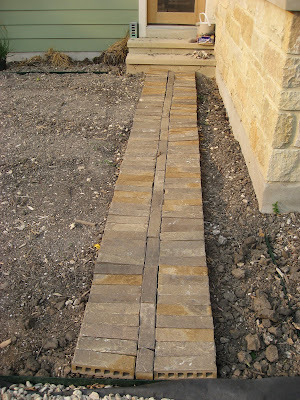 And that's how we ended up with this walkway from our back porch to the gravel area where we make our compost. I saw one of the workers pull up in his truck to take away the leftover bricks. I asked him if he was going to throw them away, and if so, could I have them. He replied yes and yes, so I loaded them up in the back of my car, took them to the house, and stacked them along the fence with plans to reuse them somewhere (raised vegetable garden beds, maybe?). 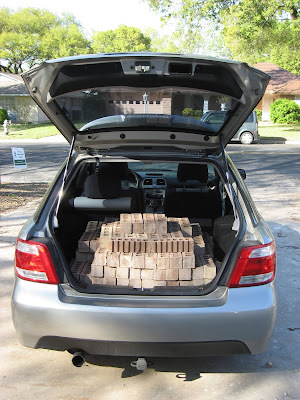 Two months later, we found an interim use for the bricks when we decided not to redo the driveway right away and needed to bridge the gap between the old driveway and the garage. 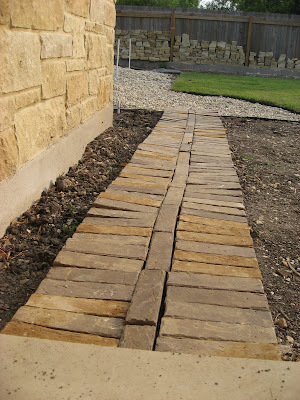 The bricks and leftover stone from the house weren't exactly pretty, but they got the job done. Last month, we finally got our new driveway, so we pulled up the bricks and stone and stacked them in the backyard again. Then, after installing all of our edging, and before the sod arrived, Steve had the idea to make a temporary passageway from the back porch steps to the gravel area so we wouldn't have to walk across dirt to take out the compost (including bunny poops, which we take out every couple of days -- and which make fantastic compost, by the way). And that's how we ended up with this not-quite-yellow brick road. We still think they would make nice raised beds, but we're also open to whatever other projects present themselves for these evidently all-purpose bricks.